As you likely already know, because you have found this page, the GPO to disable the MICROSOFT STORE app was set to be ineffective on Windows 10 Pro after build 1511. This annoying change meant that you could only block the store using a GPO if you were running Windows 10 ENTERPRISE or EDUCATION and that made admins cranky. The solution was to block the store app through a SOFTWARE RESTRICTION GPO as we explained here. However, while working with Microsoft on a bizarre Windows Update problem, we found this policy a policy with an odd side effect of killing the STORE. Oddly, the Microsoft tech was the one the pointed out this ‘issue’ to me so they have had complaints about it. If you are running WSUS and you want to block access to STORE, this is the policy for you. If you are a company and not running WSUS you should be because it is so easy and fast to configure. 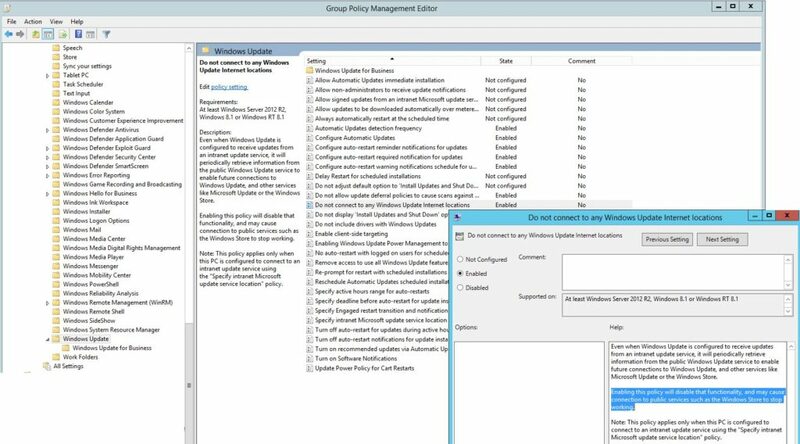 Note that we confirmed this policy does NOT affect Windows Defender / SCEP update settings if you have configured them via SCCM so if you have users that need updates to Defender while travelling and you have a ‘secondary’ update source listed in your SCCM, all is well.